Call Center as a Service (CCaaS) is a simplified, cloud-based, feature-rich service that improves customer experience with no hassle. Selling CCaaS will enable you to meet customer demand, increase your revenue, and build your brand. 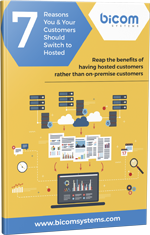 To learn more, read our 7 reasons to sell CCaaS. Learn about the value of CCaaS from two industry experts in our webinar. The webinar is over, but you can watch it on-demand – just sign up on the right. And we hosted a webinar together to tell you all about it! Thousands of hours of research on this topic would not give you the same secrets that this exciting webinar will reveal. The webinar, now available on-demand, will offer an inside look into the future telephony. 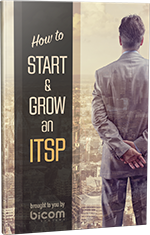 Opportunity is knocking in this exciting new industry. Will you answer the door? Learn more about the Bicom Systems Call Center solution on the product page. With no minimum and no set-up fees, ThinQ makes it easy for you to become the premier provider in your marketplace. With ThinQ you can create a custom-tailored local voice solution to fit your business needs. Other local voice solutions rely on a single provider, which can lead to limited number availability, poor performance and extraneous expenses. THINQ’s multiple-carrier solution simplifies your local voice needs by creating a custom-tailored solution that reduces your cost by 40-70%. Learn more about the ThinQ and their Toll-Free LCR on their website. Small- and medium-sized contact centers make up about 80% of the market, yet most of the premise-based Contact Center offerings available today are out of their reach. Contact Center apps have traditionally been large CapX, human-resource-intensive software geared toward large contact centers. How many calls are coming in? When is the peak time for inbound calls? How long are customers on hold? How many customers hang up? But cloud-based CCaaS changes everything for small and medium-sized contact centers. It is feature-rich, easy-to-use (the mantra in this new marketplace! ), and can be up and running in days instead of months. 80% of the market is waiting for such a solution – could you be the one to give it to them? A small business with inbound order taking – CCaaS can automate their order process and prevent a lot of headaches. They probably do not even realize they are looking for contact center features, but each of those examples would be a perfect CCaaS customer. What about your existing customers – have they been asking for these kinds of features? The per-seat retail price for a contact center is nearly double that of a hosted seat. What many are failing to realize is that your customers and prospects are more than willing to pay this if it means the opportunity to have data that will help them manage their business better. 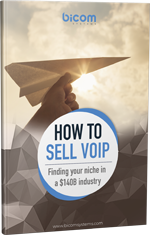 A common pitfall in today’s marketplace is thinking of VoIP is a commodity that our customers want for as cheap as possible. This could not be farther from the truth. This kind of thinking cheats ourselves and our customers, requiring them to work longer and more frustrating hours to achieve less. Start offering CCaaS and its features – not only will your customers pay for it, they will probably thank you for stepping up. Our entire industry is making the gradual move to the cloud, so it makes sense for contact centers to follow suit. Just one example – the global Cloud PBX market is expected to double in value by 2023, growing at a CAGR of 14.9%. Cloud-based anything gives us features and flexibility that are no longer bonuses, but expectations. So, it is no surprise the cloud-based CCaaS is so feature-rich, scalable, and user-friendly. 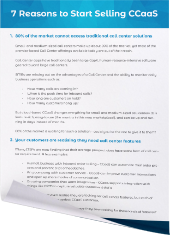 CCaaS can reduce customer churn in two ways. One, your existing customers likely already want these features whether they realize it or not. By meeting that demand you head off the risk of them switching to a different provider. Two, anything that increases regular interaction with your customers is bound to be good for your stickiness. Customers that develop an ongoing relationship with their vendor tend to become much more loyal than those that are limited to a one-time transaction. CCaaS will be a complex, integral part of your customers’ businesses, so it stimulates a long-term commitment. Regular upgrades and integration with other pieces of your offering will contribute to that relationship as well. According to the Gartner Magic Quadrant for CCaaS in North America, there are only ten CCaaS solutions on the North American market today. With the CCaaS market growing so quickly, we would expect the quadrant to begin filling up. Now, with the competition at a low-point, is an ideal time to throw your hat in the ring. One of your primary goals is probably building your own brand and securing it for the future. One way to do this is by turning your individual products into bundles that encourage customer commitment, increase your value, and make it easier to keep pace with industry trends and emerging technologies. In a marketplace where prospects are short on time and high on expectations, a “one-stop-shop” is going to be a winner in their eyes. CCaaS is one step closer to attaining that goal. CCaaS could be your ticket into new worlds like Voice and the Cloud, allowing you to eventually expand to UCaaS and beyond.